RedVector is pleased to announce the release of a brand new Health, Safety, and Environment course that will introduce and describe the characteristics of Triethylaluminium (TEAL). 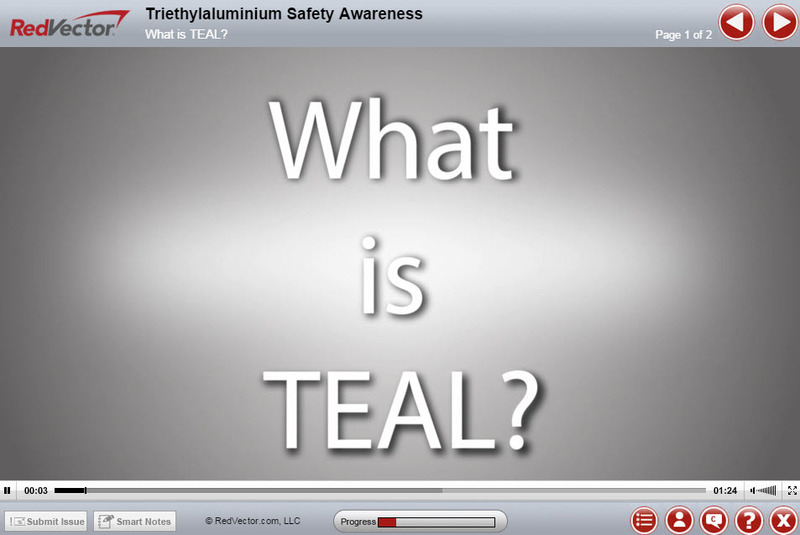 The course, titled Triethylaluminium Safety Awareness, will discuss the health hazards of TEAL and how to reduce exposure through workplace controls as well as how to mitigate danger through safe work practices and proper PPE. This hour-long RedVector course will give students a better understanding of the hazards of triethylaluminium (TEAL). By the end of this course, students will be able to select safe work practices for TEAL, recognize safe handling and storage requirements, recall Personal Protective Equipment (PPE) requirements, and provide training requirements. The course includes video and audio-driven elements and is compatible with mobile devices. RedVector is the leader in online education and training, offering over 2000 courses for professionals. We are excited to offer this newest course and have many other exciting courses launching soon. Be sure to follow our blog and check us out onFacebookand Twitter to stay up-to-speed on all the latest eLearning news and course launches! For more information about this or other RedVector courses, contact our client support department today.